Windows 7 RC will be available and can be downloaded from the Microsoft Download Center on May 5th. Windows 7 delivers advanced capabilities to improve workforce effectiveness and productivity – driving maximum value from IT investments. As IT Pros, owners or consultants for small and medium businesses, you will find that Microsoft is committed to delivering tools and support that enhance manageability, security, software compatibility, as well as ease deployment and migration concerns. Microsoft have made a number of enhancement, bug fixes between the beta and RC milestone. Q: How big is the Window 7 RC download? A: The x86 version of Windows 7 RC is approximately 2.47 gigs. The x64 version is approximately 3.2 gigs. Q: Will the RC code be download-only, or can I have physical media mailed to me? A: The Windows 7 RC code will only be available for download. Q: Will my product key from Beta work for the RC, or do I have to register to get a new one? A: No – you will need to register for a new PID in order to run RC. Q: Is there a cap to the total number of downloads for Windows 7 RC? A: There is no limit to the total number of downloads for Windows 7 RC. Q: Will Windows 7 RC be available in both 32-bit and 64-bit? Q: Is there a choice of SKUs for Windows 7 RC, or is it only available in Ultimate like the beta? A: There is one release candidate release, with all the capabilities of the Windows 7 Ultimate SKU. Q: When does this build expire? A: Windows 7 RC will expire on March 1, 2010 – at this time the system will reboot every two hours. The license of windows 7 RC will expire June 1, 2010. Q: Where should I submit feedback on Windows 7 RC? A: The Beta testing has completed, and the release candidate is the time for customers and IT professionals to really start kicking the tires in terms of application compatibility, drivers and devices. We will of course continue error monitoring, but application compatibility issues should be reported to the ISV. Q: What tools and resources are there available for IT pros to begin testing and deploying Windows 7? Q: How does Microsoft recommend I install RC? A: To install the Windows 7 RC, users will be required to either upgrade from a Windows Vista image, or do a custom (clean) installation. Windows 7 Beta users will need to do a custom (clean) installation. Q: Why isn’t there an easy way for me to upgrade from beta to RC? A: Upgrading from one pre-release build to another is not a scenario a real-world customer will experience. We want our testers to experience real-world setup to provide us with real-world telemetry as we work on finalizing the product. Q: Is there a smooth upgrade from Windows XP to Windows 7? A: As a result of the many changes we’ve made to the operating system, users who wish to upgrade from Windows XP to Windows 7 on the same computer will need to perform a custom (clean) installation. Q: Does Microsoft provide any guidance on how to transfer files and settings from a previous operating system to Windows 7 when a clean installation is required? A: Tools, guidance and other resources are available on windows.microsoft.com to assist in the upgrade process. Microsoft also provides a special utility on the release candidate CD to assist users with identifying, backing up and transferring files and settings to Windows 7. For more information on the Windows Easy Transfer utility please visit http://technet.microsoft.com/en-us/library/dd446674.aspx. If you would rather, you may create a desktop shortcut to the Feedback Tool command by right-clicking on your desktop, selecting New, Shortcut, then entering “rundll32.exe FeedbackTool.dll,ShowWizard” (less the quotes) in the “Type the location of the item” field. Then click Next, provide a shortcut name (for example, “Send Feedback”), then click Finish. You may then launch the Feedback Tool from the desktop shortcut. * Note – Please be sure you have activated your copy of Windows 7 using your product key PRIOR to using the Windows Feedback Tool. Update for Windows Server 2008 x64 Edition (KB967902) to fix this issue. The Beta Linux ICs provide synthetic device support for SUSE Enterprise Linux 10 running in a Hyper-V R2 Beta virtual machine. This includes a port of VMBus as well as drivers to support the synthetic network adapter and synthetic storage controller. With these new Linux IC’s for Hyper-V R2 performance of Linux is significantly improved. Internal benchmarks are showing considerably improved levels of throughput, and networking performance has increased substantially over V1. You can grab the Integration Components from here. Building on the advances made above with the Linux IC’s, one of the most common questions we’ve received from both internal users as well as our external customers has been the lack of an enlightened mouse driver, which caused issues when remotely connecting to a Hyper-V host and trying to interact with a Linux guest, and in all honesty, the whole Linux mouse control experience needed to be better. To solve the problem, Citrix have released the InputVSC driver for Hyper-V. This driver provides enlightened mouse driver support for Linux virtual machines, allowing the mouse to be moved in and out of the VMConnect window without using the CTRL-ALT-LeftArrow escape sequence. This driver also enables the use of the mouse when connected to a remote Hyper-V host over a Remote Desktop Connection session. Talking About Windows…. Are they listening to what you have to say? Do you agree that the Windows XP no longer meets our needs? Do you think that Windows 7 will meet? Which feature of Windows 7 do you most like ? Direct Access, reliability, security, performance, compatibility… Are they listening to what you have to say? what’s behind the Windows 7 engineering process ? Post your comments!!! After that, you can’t say "They are not listening…." This post is a list of questions and answers for those trying to get started with the Microsoft hypervisor. It is based in part on information provided during the Hyper-V technology adoption programme and has been used with the kind permission of Microsoft Windows Virtualization product team supplemented with additional information where appropriate. It was originally posted by Mark Wilson and now I am updating/adding information about Hyper-V R2 and SCVMM R2. Share !!!! Q. What are the major changes in R2? A. The Hyper-V™ role enables you to create and manage a virtualized server computing environment by using a technology that is part of Windows Server® 2008 R2. The improvements to Hyper-V include new live migration functionality, support for dynamic virtual machine storage, and enhancements to processor and networking support. Live migration allows you to transparently move running virtual machines from one node of the failover cluster to another node in the same cluster without a dropped network connection or perceived downtime. Live migration requires the failover clustering role to be added and configured on the servers running Hyper-V. In addition, failover clustering requires shared storage for the cluster nodes. This can include an iSCSI or Fiber-Channel Storage Area Network (SAN). All virtual machines are stored in the shared storage area, and the running virtual machine state is managed by one of the nodes. Q. What existing functionality is changing? Dynamic virtual machine storage. Improvements to virtual machine storage include support for hot plug-in and hot removal of the storage. By supporting the addition or removal of virtual hard disks and physical disks while a virtual machine is running, it is possible to quickly reconfigure virtual machines to meet changing requirements. You can also add and remove both virtual hard disks and physical disks to existing SCSI controllers of virtual machines. Hot plug-in and removal of storage requires the installation of Hyper-V integration services (included in Windows Server 2008 R2) on the guest operating system. Enhanced processor support. You can now have up to 32 physical processor cores. The increased processor support makes it possible to run even more demanding workloads on a single host. In addition, there is support for Second-Level Address Translation (SLAT) and CPU Core Parking. CPU Core Parking enables Windows and Hyper-V to consolidate processing onto the fewest number of possible processor cores, and suspends inactive processor cores. SLAT adds a second level of paging below the architectural x86/x64 paging tables in x86/x64 processors. It provides an indirection layer from virtual machine memory access to the physical memory access. In virtualization scenarios, hardware-based SLAT support improves performance. On Intel-based processors, this is called Extended Page Tables (EPT), and on AMD-based processors, it is called Nested Page Tables (NPT). Enhanced networking support. Support for jumbo frames, which was previously available in nonvirtual environments, has been extended to be available on virtual machines. This feature enables virtual machines to use jumbo frames up to 9,014 bytes in size, if the underlying physical network supports it. Q. Why The Live Migration change is important? Provides better agility. Datacenters with multiple servers running Hyper-V can move running virtual machines to the best physical computer for performance, scaling, or optimal consolidation without affecting users. Reduces costs. Datacenters with multiple servers running Hyper-V can service their servers without causing virtual machine downtime or the need to schedule a maintenance window. Datacenters will also be able to reduce power consumption by dynamically increasing consolidation ratios and turning off unused servers during times of lower demand. Increases productivity. It is possible to keep virtual machines online, even during maintenance, which increases productivity for both users and server administrators. Q. Are there any dependencies for Live Migration? Live migration requires the failover clustering role to be added and configured on the servers running Hyper-V.
A. Hyper-V is available as a role for x64 Editions of Windows Server 2008 Standard Enterprise or Datacentre editions (i.e. not for 32-bit x86 or Itanium architectures nor for web edition). The Hyper-V role is supported on either a server core or a full installation; however server core is recommended due to its increased security. In addition there is a standalone version of Hyper-V – Microsoft Hyper-V Server 2008 – designed for organisations who would like the benefits of Hyper-V but who do not run Windows (a comparison of features in the various Hyper-V products is available). A. Windows Server 2008 shipped with a beta version of Hyper-V. It is necessary to install an update to bring the Hyper-V components up to their RTM level as well as to update the integration components in the virtual machines. John Howard has blogged extensively on obtaining Hyper-V changes at RTM upgrade considerations and more. Enable CPU virtualisation assistance and DEP in the BIOS. Install Windows Server 2008 Enterprise x64 (Core Installation). Determine the NIC ID: netsh interface ipv4 show interfaces. Set the IP address for NIC, let say for NIC #2: netsh interface ipv4 set address name=”2″ source=static address=192.168.1.3 mask=255.255.255.0 gateway=192.168.1.1. Set the DNS: netsh interface ipv4 add dnsserver name=”2″ address=192.168.1.2 index=1. Rename server: netdom renamecomputer %computername% /NewName:HyperSvr1. Reboot for that to take effect: shutdown /r /t 0. Join it to domain: netdom join %computername% /domain:admininfo.local /userd:administrator /passwordd:*. Download and copy the Hyper-V update onto the server. Install the Hyper-V update: wusa.exe Windows6.0-KB950050-x64.msu. Install the Hyper-V role: start /w ocsetup.exe Microsoft-Hyper-V.
Pass-through disks can sustain physical device throughput.Fixed VHDs can also sustain physical device throughput at the cost of slightly higher CPU usage.Dynamically expanding and differencing VHDs do not usually hit physical throughput numbers due to the overhead of expansion and greater likelihood of disk fragmentation. Q. Sometimes my virtual machines are paused automatically – why does this happen? A. Integration Components (ICs) are version specific – i.e. the versions used within the child partitions must match the version of Hyper-V that is running in the parent partition (Windows Server 2008 RTM was shipped with the Hyper-V Beta ICs). The Hyper-V RTM upgrade package (see Microsoft knowledge base article 950050) includes the updates for both the parent and child partitions. 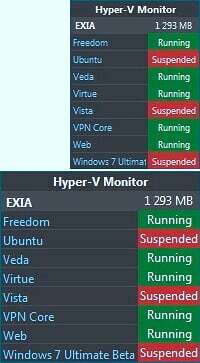 In addition there are Hyper-V ICs for Linux and Professional Enterprise and Ultimate versions of the Windows 7 and Windows Server 2008 R2 betas already come with Hyper-V integration components installed. A. Performing maintenance on a Hyper-V host from within WinPE represents a challenge for systems administrators in that without the integration components virtual hard disks (.VHDs) must be connected to the IDE controller (limiting the number of VHD’s that can be used at any given point in time) and legacy network adapters might be required in order to provide network access. Mike Sterling has a great blog post on using the Hyper-V integration components with WinPE (using the Windows Automated Installation Kit to create a custom WinPE image including the appropriate files extracted from the Hyper-V integration services setup disk). Attaching the resulting .ISO image to a VM and powering it on should provide full access to all synthetic devices. – Hyper-V Manager ( Microsoft Management Console (MMC) snap-in ). This snap-in is also available for x86 (32-bit) versions of Windows Server 2008 as well as for Windows Vista SP1 and Windows 7. Whilst Hyper-V Manager is adequate for managing a single host (locally or remotely) remote management with System Center Virtual Machine Manager (SCVMM) 2008 provides a centralised management console designed to manage thousands of VMs across hundreds of physical servers running Virtual Server 2005 Hyper-V or even VMware ESX via VMware Virtual Center. Hyper-V can also be managed using Windows Management Instrumentation (WMI) for example in a Windows PowerShell script and there is an open source PowerShell Management Library for Hyper-V available on CodePlex. $VHDName = Read-Host "Specify the name of the virtual had disk to compact"
Q. What else can SCVMM offer that the standard management tools do not? What’s New in SCVMM R2? Comprehensive Hypervisor Management – SCVMM 2007 already lets you manage Virtual Server and now we’ve added support for Hyper-V (including Hyper-V Server) and even VMware based environments (ESX and 3i) through a single management console and a single Powershell command line interface. If you’ve been using virtualization for some time now, chances are that you have some VMware. If you have Windows Server 2008 deployed, you already have Hyper-V. Now, with SCVMM 2008, you can manage both in a seamless and fully integrated way – every feature of SCVMM works against each of the supported virtualization platforms but we still enable features specific to each including Quick Migration on Hyper-V and Vmotion on VMware. Physical Resource Optimization (PRO) – By integrating the application specific knowledge provided by System Center Operations Manager, SCVMM allows you to calibrate your resource assignments based upon the real-time demands of your datacenter. Rather than migrating VMs around based on generic metrics like CPU and memory utilization, we’ve worked closely with partners to provide you with the best possible information (specific to your environment) before making changing to your infrastructure. In the coming weeks, look for new SCVMM PRO partners announcements on this blog. Delegated Administration – SCVMM allows you to segment your environment and assign management authorization to each segment to different Active Directory users and/or groups. In addition, SCVMM provides an integrated web-based self-service user interface allowing authorized users to provision and manage their own virtual machines. Administrators can control which templates these users can provision VMs from, determine which actions they are allowed to take and even assign quotas for chargeback purposes. Highly Available Virtual Machines – SCVMM makes enabling high availability for virtual machines as simple as a single click. Our intelligent placement feature ensures that the VM is deployed or migrated only to a highly available physical host (using Windows clustering for Hyper-V or VMware HA for ESX) and configures the VM for high availability on that host. Integrated Physical and Virtual Machine Management – SCVMM isn’t an island – it is part of the comprehensive System Center family of products. System Center allows you to patch, monitor, back up, deploy and manage your entire physical and virtual infrastructure. · Support for Live Migration: With Windows 2008 R2 adding support for Live migration, it’s now added as a new migration option in VMM R2. Live migration requires the source and destination host to be part of a failover cluster and that the VM is on a shared storage. Live migration means that there is no user perceived downtime; since the VM’s memory pages are being transferred, the hosts’ processors need to be the same (manufacturer and processor architecture). Our competition claims that Vmotion doesn’t require clustering but this only works for planned downtime and not for unplanned downtime. By combining Live migration and clustering, Hyper-V addresses both planned and unplanned downtime. · Multiple VMs per LUN: VMM 2008 didn’t allow placing multiple VMs per LUN even though Hyper-V allowed it and the reason was that the LUN ownership was on a per host basis. This meant that migrating any VM on that shared LUN would result in all other VMs being migrated as well which can result in a confusing user experience (I’ve blogged about this at length). With CSV (Clustered Shared Volumes) in Windows 2008 R2, a single LUN is accessible by all hosts within a cluster. This enables a VM that’s on a shared LUN to be migrated without affecting other VMs on that LUN. As a result, with VMM R2, we’ll allow multiple VMs to be placed on the same LUN if CSV is enabled on the cluster. · SAN related enhancements: We’ve done a number of SAN related enhancements in VMM R2. o SAN migration in and out of clusters: With VMM R2, you can migrate a VM from one cluster to another or from a standalone host into a cluster or vice versa. Especially useful when you are deploying a VM from a test cluster to a production one. o Multiple LUNs per single iSCSI target: VMM 2008 supported only initiator-based iSCSI target connection, which allows only one LUN per iSCSI target. VMM 2008 R2 adds support for masking-based target connections, which allows multiple LUNs per iSCSI target and expands VMM support for iSCSI SAN providers. This implies that we have better support for iSCSI products from Network Appliance and EMC for example. § In VMM 2008, port groups were always created even if the admin had already created them on the host. § In VMM R2, the admin is allowed to pick an available port group that’s already defined. o For servicing a host, VMM R2 allows host to be put in maintenance mode: When you do this, all VMs on that host that are running are live migrated off the host to avoid downtime. o During placement, a Host that’s in maintenance mode gets zero star ratings. This also p-prevents PRO from picking this host when migrating VMs. As you can see, there are a number of enhancements we’ve introduced in R2 along with fixing some important issues reported by customers and partners. We are not done yet! In addition to responding to more feedback from beta testers, there are a few more features in the pipeline for post Beta so stay tuned. · Hyper-V Update for Windows Server 2008 x64 Edition (KB950050) (http://go.microsoft.com/fwlink/?LinkID=142900). · Hyper-V Update for Windows Server 2008 x64 Edition (KB956589) (http://go.microsoft.com/fwlink/?LinkID=113199). · Update for Windows Server 2008 x64 Edition (KB956774) (http://go.microsoft.com/fwlink/?LinkId=128540). Q. How can I patch the virtual machines that are held offline (templates etc.)? By consolidating many servers onto onto a smaller number of servers using virtualisation then many servers may be retired. These older servers are likely to be less efficient than a modern server and will all require cooling resulting in further power cooling savings. Whilst disposal of old servers is not very “green” some servers may be redeployed in scenarios where a physical infrastructure is still required. A. When the Hyper-V server role is enabled system sleep states (standby and hibernate) are disabled. The major savings in power and cooling requirements are gained by switching servers off and by viewing overall demand for the entire virtualised infrastructure rather than working at an individual sever level it is possible to use management technologies to bring servers on and offline in order to meet demand. Q. With Microsoft Virtual Server it’s really difficult to access the virtual machine BIOS. Is there still a virtual machine BIOS? A. Hyper-V VMs do still have a virtual machine BIOS; however all of the BIOS features (e.g. numlock setting boot device order etc.) may be set in the virtual machine configuration or using a script. As a conseqence of this Microsoft has removed the ability to access the BIOS at boot time. Q. Can a virtual machine boot from SAN (FC or iSCSI) NAS USB disk or Firewire disks (the boot order in the BIOS settings only shows floppy CD IDE and network)? Local storage (IDE or SCSI).USB storage (USB key or disk).Firewire storage.SAN Storage Area Network (iSCSI or fibre channel).NAS Network Attached Storage (file share NAS device). A. Not directly and although many people would like to see this functionality Microsoft is adamant that this is a client-side virtualisation feature and have no plans to include USB support in the product at this time. There is a workaround using the Remote Desktop Connection client though (and this approach can also be used for audio). A. With Hyper-V the simplest approach I’ve found for moving virtual machines is to export the VM and import it to a new location. Alternatively you could move the VHD and create a new virtual machine configuration. A. It’s not as confusing as it first looks! The parent partition is also virtualised and all communications run via a virtual switch (vswitch). In effect the physical network adapters (pNICs) are unbound from all clients services and protocols except the Microsoft Virtual Network Switch Protocol. The virtual network adapters (vNICs) in the parent and child partitions connect to the vswitch. Further vswitches may be created for internal communications or bound to additional pNICs; however only one vswitch can be bound to a particular pNIC at any one time. Virtual machines can have multiple vNICs connected to multiple vswitches. Ben Armstrong has a good explanation of Hyper-V networking (with pictures) on his blog and I described more in an earlier post on Hyper-V and networking. A. Out of the box Hyper-V does not support connecting virtual machines to wireless network adapters. As a primarily server focused product this is a reasonable limitation – especially given evils that we need to do to get wireless network adapters to work with virtual machines. But all is not lost – it is possible to setup an internal virtual network (as discussed yesterday) and utilize Internet Connection Sharing (as discussed here) to get you up and going. A. This feature is designed to allow backwards compatibility for older operating systems such as Windows NT 4.0 (which performs a CPUID check and if CPUID returns more than three leaves it will fail). By selecting the processor functionality check box Hyper-V will limit CPUID to only return three leaves and therefore allow Windows NT 4.0 to successfully install. It is possible that other legacy operating systems could have a similar issue. A. The difference here is between “possible” and “supported”. Many legacy (and current) operating systems will run on Hyper-V (with emulated drivers) but are not supported. Windows NT is no longer supported whether it is running on physical or virtual hardware. Microsoft do highlight that Windows NT 4.0 has been tested and qualified on Virtual Server 2005 and that Virtual Server may be managed (along with Hyper-V and VMware ESX) using System Center Virtual Machine Manager 2008. Setup a virtual network just as you would for physical systems.Use a virtual CD/DVD creation tool and insert a virtual CD/DVD; this can be done while the virtual machine is running. Microsoft’s stated position is that in the case of client-side virtualisation a single user is running a virtualisation product (e.g. Virtual PC) locally ands expects the capability to move files from one virtual machine to another. For this reason Virtual PC includes shared folder support (but are not set by default).